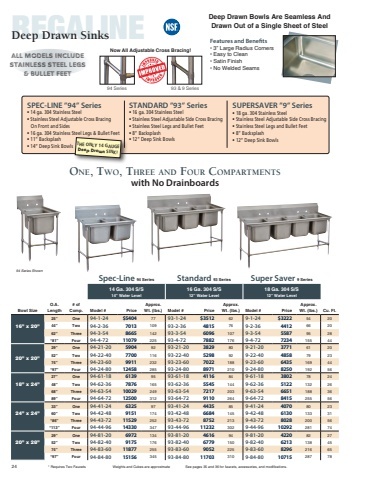 RDeeEp DGrawAn SLinkIsNE FOuR COmpARTmENTS wiTh TwO dRAiNBOARdS   94 Series Shown O.A. DRBD. Bowl Size Length Size 110” 18” 16” x 20” 122” 24” 146” 36” 126” 18” 20” x 20” 138” 24” 162” 36” 118” 18” 18” x 24” 130” 24” 154” 36” Spec-Line 94 Series Approx. Standard 93 Series Approx. Super Saver 9 Series Approx. Cu. 14 Ga. 304 S/S 14” Water Level 16 Ga. 304 S/S 12” Water Level 18 Ga. 304 S/S 12” Water Level   Model # Price Wt. (lbs.) Model # Price Wt. (lbs.) Model # Price Wt. (lbs.) Ft. 58 64 86 87 95 111 82 90 106 106 122 350 97 361 106 395 124      94-4-72-18RL 94-4-72-24RL 94-4-72-36RL $7521 210 7661 275 8221 313  93-4-72-18RL 93-4-72-24RL 93-4-72-36RL $6482 183 6580 252 6780 287    9-4-72-18RL 9-4-72-24RL 9-4-72-36RL $6012 175 6093 241 6452 274    94-24-80-18RL 94-24-80-24RL 94-24-80-36RL 8774 293 8863 312 9499 351  93-24-80-18RL 93-24-80-24RL 93-24-80-36RL 7551 268 7648 286 7858 322    9-24-80-18RL 9-24-80-24RL 9-24-80-36RL 6780 259 6840 275 7195 308    94-64-72-18RL 94-64-72-24RL 94-64-72-36RL 8778 358 8864 372 9480 409  93-64-72-18RL 93-64-72-24RL 93-64-72-36RL 7592 346 7685 355 7889 392    9-64-72-18RL 9-64-72-24RL 9-64-72-36RL 6843 336 6905 344 7249 378    94-44-96-24RL 10471 395 94-44-96-36RL 11226 431   93-44-96-24RL 9863 361 93-44-96-36RL 10089 398     9-44-96-24RL 8734 348 9-44-96-36RL 9496 382         24” x 24” 154” 24” 178” 36”       126” 18” 20” x 28” 138” 24” 162” 36” ALL UNITS REQUIRE TWO FAUCETS 94 Series Shown O.A. DRBD. Bowl Size Length Size 95” 18” 16” x 20” 101” 24” 113” 36” 111” 18” 20” x 20” 117” 24” 129” 36” 103” 18” 18” x 24” 109” 24” 121” 36” 94-84-80-18RL 10645 94-84-80-24RL 10780 94-84-80-36RL 11581 382 402 442 93-84-80-18RL 10076 93-84-80-24RL 10211 93-84-80-36RL 10410 361 374 411 9-84-80-18RL 9512 9-84-80-24RL 9647 9-84-80-36RL 9760 Model # Price Wt. (lbs.) Model # Price Wt. (lbs.) Model # Price Wt. (lbs.) Ft. 52 54 60 61 82 90 72 76 84 92 100 317 87 329 91 347 100 Weights and Cubes are approximate  FOuR COmpARTmENTS wiTh ONE dRAiNBOARd Spec-Line 94 Series Approx. Standard 93 Series Approx. Super Saver 9 Series Approx. Cu. 14 Ga. 304 S/S 14” Water Level 16 Ga. 304 S/S 12” Water Level 18 Ga. 304 S/S 12” Water Level        94-4-72-18RorL 94-4-72-24RorL 94-4-72-36RorL $7251 202 7317 216 7835 260  93-4-72-18RorL 93-4-72-24RorL 93-4-72-36RorL $6225 165 6267 186 6463 238    9-4-72-18RorL 9-4-72-24RorL 9-4-72-36RorL $5788 158 5814 175 6182 227    94-24-80-18RorL 94-24-80-24RorL 94-24-80-36RorL 8563 299 8610 320 9120 341   93-24-80-18RorL 93-24-80-24RorL 93-24-80-36RorL 7400 241 7426 250 7526 267     9-24-80-18RorL 9-24-80-24RorL 9-24-80-36RorL 6155 229 6684 239 6767 250    94-64-72-18RorL 94-64-72-24RorL 94-64-72-36RorL 8574 339 8621 351 9115 369 93-64-72-18RorL 93-64-72-24RorL 93-64-72-36RorL 7447 329 7473 338 7572 353   9-64-72-18RorL 9-64-72-24RorL 9-64-72-36RorL 6351 318 6751 329 6827 341    94-44-96-24RorL 10185 354 94-44-96-36RorL 10531 376   93-44-96-24RorL 9649 336 93-44-96-36RorL 9769 355     9-44-96-24RorL 8547 327 9-44-96-36RorL 9209 344         24” x 24” 133” 24” 145” 36”       111” 18” 20” x 28” 117” 24” 129” 36” ALL UNITS REQUIRE TWO FAUCETS 24 94-84-80-18RorL 10397 94-84-80-24RorL 10473 94-84-80-36RorL 11142 348 364 382 93-84-80-18RorL 9878 93-84-80-24RorL 9953 93-84-80-36RorL 10032 329 337 355 9-84-80-18RorL 9324 9-84-80-24RorL 9403 9-84-80-36RorL 9443 Weights and Cubes are approximate See pages 29 and 30 for faucets, accessories, and modifications.